We’re doing plant starts again this year – peppers, tomatoes and eggplants. We will also be doing artichoke plants again and hopefully be including herbs. Last year we sold out within 3 weeks so I wanted to give you all a chance to pre-order them so you can get the varieties you want. We will also be increasing our production along with adding more varieties. If you want specific varieties please let me know (contact us below) and I will make sure I have plants set aside for you. They are $3.50 each or 3 for $10. They will be available for planting around mid March. We will also hopefully be selling them again at Moschetti’s as well as a possible second location (stay tuned). Last year we attended a tomato tasting and then held our own tomato tasting event. Our primary focus was finding tomatoes that were not only productive but also had exceptional flavor. Some of the varieties we grew last year didn’t make the cut but we found many more to take their place. Diamond – A good, productive Japanese style eggplant. Very good sliced, marinated and grilled. 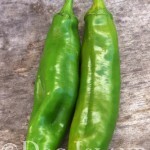 Anaheim (Nu Mex Joe E. Parker) – These are the perfect roasting peppers. The thick skin easily blisters and can be peeled away after roasting. They are mild to medium heat. Not quite as productive as the smaller hot peppers, but they do give a good harvest when picked continuously. 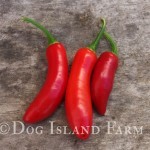 Cayenne Slim – Very productive plant of HOT peppers. Walls are thin so they dry quickly. We dried the peppers (they readily dry on the plant) and then ground them into red pepper flakes. We now call them Satan Flakes because of their excessive heat. Craig’s Grande Jalapeno – Sometimes you just want a middle-of-the-road hot pepper. We generally haven’t had much luck getting jalapenos hot enough for our taste, but this year we’re going to give this variety a try and see if we can see some success. No other pepper seems to work as well as the trusty jalapeno for escabeche. 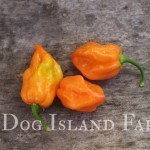 Mustard Habanero – I got several emails this past year from people that were very happy with these plants. If you want your peppers to be spicy make sure to grow them next to a habanero plant. This was a trick I learned from a friend and was surprised to find out that it works! These are productive plants with EXTRA HOT peppers. 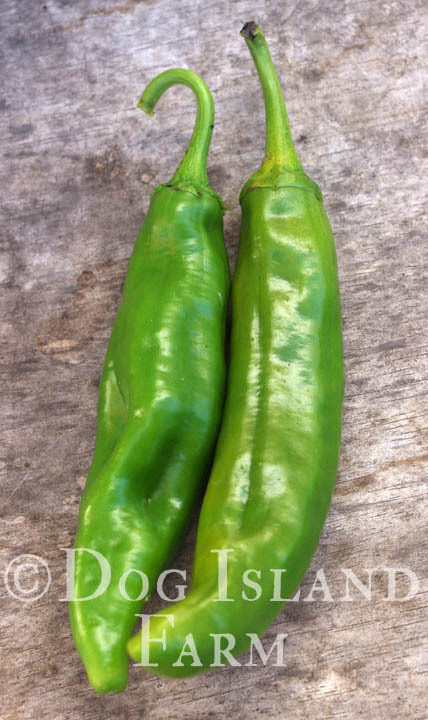 Serrano Tampequino – Another very productive pepper with thick walls that are perfect for making hot sauce. The original variety used to make Sriracha Hot Sauce. Also very hot, but not as hot as the Cayenne Slim. 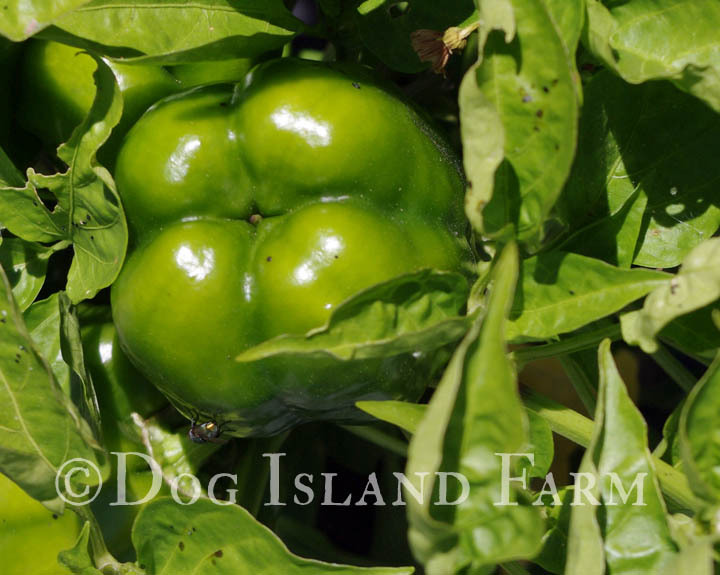 California Wonder – The standard green and red bell pepper for California. Good production with thick walled fruits. 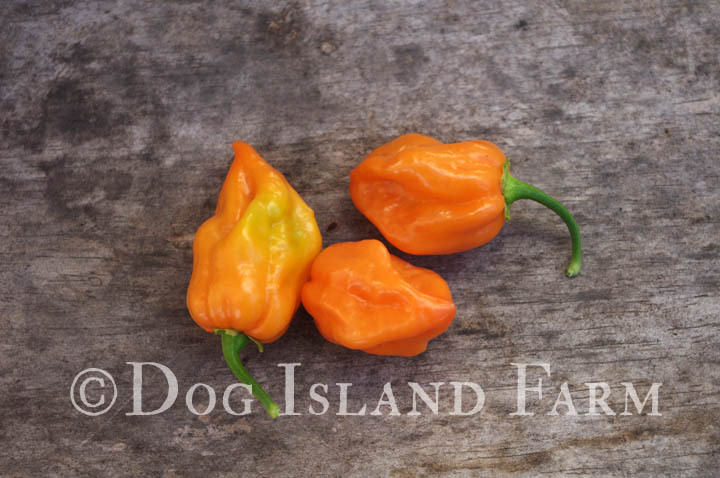 Etuida Bell – When I read that this was considered one of the best tasting peppers out there, I had to try it. It is a productive producer of very large, thick skinned fruit. 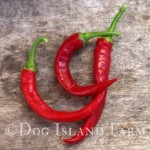 Horizon Bell – This is a pepper to replace the Orange Bell as it is more productive while not sacrificing flavor. Purple Beauty – We grew this on a whim last year and were surprised at how well it sells. It produces a multitude of medium sized, thin walled purple fruit that are easy to find in among the foliage. Quadrato Asti Giallo – This has been our most productive bell pepper giving us good sized, thick walled fruit all through summer. This is an Italian pepper that is green slowly ripening to yellow. 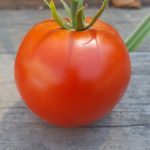 Aussie – This large red tomato is a replacement for Brandywine, which is popular, but just can’t win the taste tests like Aussie can. 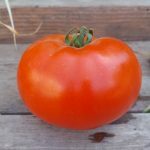 Aussie offers a very well balanced old-fashioned tomato flavor in a large, 1lb package on large vigorous plants. 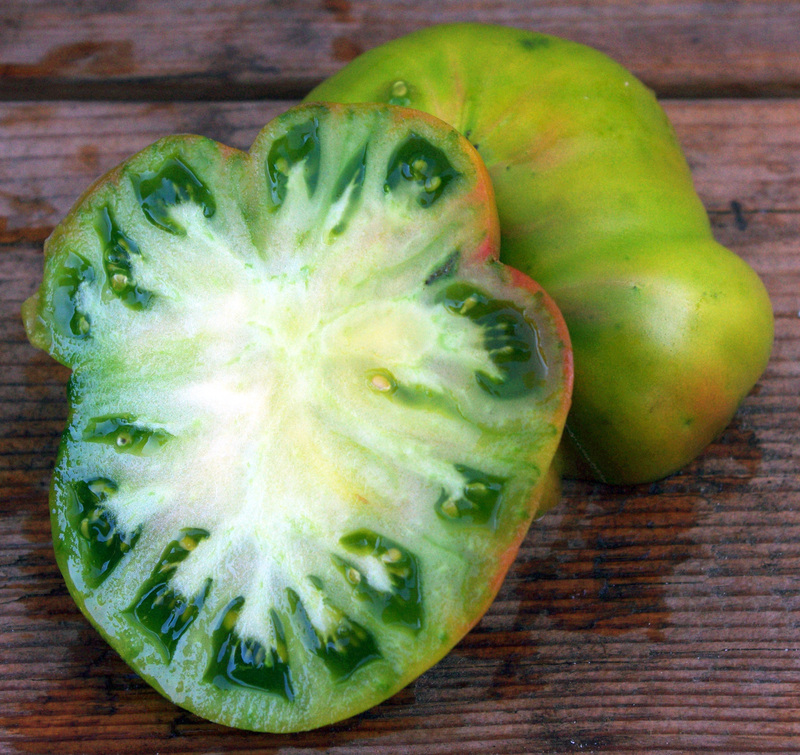 Cherokee Green – A green beefsteak that has a bold, bright flavor with acid. My husband says it’s “zingy.” Best flavor of the green tomatoes. Very productive plant. Just keep an eye on it so you don’t wait too long to pick the fruits which will have a yellow hue with ripe. 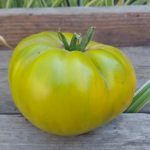 Dixie Golden Giant – A whopper of a tomato coming in at almost 2lbs, this lemon yellow tomato has an incredible mild and sweet, fruity flavor. Shows some disease resistance and like most Amish varieties is very productive. Green Zebra – Small 2-1/2″-3″ salad tomato that is green with darker green stripes. Fruit is sweet and “zingy.” Very productive plant if you can find all the fruit! The light green will have a yellow hue when ripe. Makes a really good green pesto bruschetta. Henderson’s Winsall – The original Winsall variety obtained from the USDA Seed Bank. 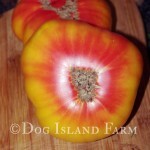 A pink beefsteak heirloom that is nearly seedless. It is a late variety but the superb flavor is worth the wait. 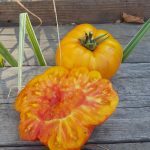 Hillbilly – Big yellow orange beefsteak with red streaks. Husband describes it as “rich, meaty, tomato-y goodness.” The favorite tomato around here. Few seeds and very fleshy. 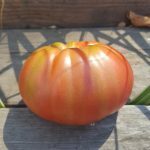 Mr. Stripey – For whatever reason, many striped tomatoes tend not to have as much flavor as their solid colored compadres. I surmise that it is due to the coloring of the striped tomato being the primary focus, rather than the flavor. Mr. Stripey, fortunately, is not one of them. These are smaller salad size tomatoes with a rich, tangy flavor. 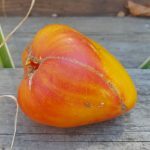 Rosso Sicilian – This is an Italian heirloom with small to medium sized ribbed fruits that are firm and meaty and perfect for making sauce and paste. Bruises easily. Rated as one of the better tasting tomatoes we grew last year. Super Sioux – A variety of Sioux that takes heat and drought better. While Sioux is better for fresh eating, Super Sioux is better suited for canning. Tangerine – This is our replacement for Kellogg’s Breakfast. A productive yellow-orange beefsteak with improved flavor that is meaty, sweet and rich. 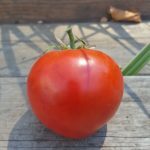 Thessaloniki – A red Greek tomato that resists cracking and sun scald. Fantastic old fashioned acid tomato flavor. I have farmer friends that say they only will start selling the fruit from this variety after they physically can no longer eat them. Sorry, we are no longer taking pre-orders for this season. Feel free to visit The Hub in Vallejo at 350 Georgia St in downtown on Saturday mornings from 10am -2pm to purchase plants. Thanks! 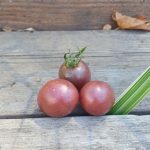 Black Cherry *SOLD OUT* Rich, sweet and complex, this true black tomato is productive and irresistible. Green Grape Small, compact plants with easy to harvest fruit that full of sweet, tart, juicy flavor. Prolific producer. Isis Candy Orange cherry tomato with red starburst. Very productive of small sweet, fruity tomatoes that you can just pop in your mouth. In our opinion it has better flavor that Sungolds. Snow White Sweet ivory colored cherries that are hard to resist just popping into your mouth while picking them. 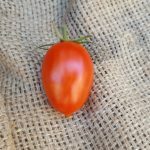 They are the sweetest cherry tomatoes we've tried while still maintaining a complex flavor profile. Truly a favorite here. Amish Paste Of the many paste tomatoes we tasted, this one was far and away, the best tasting. I look forward to trying the concentrated flavor of these when canning. Nice sized red Roma type tomatoes that are good for both canning and fresh eating (something you can’t say about most paste tomatoes). Fresh they are very sweet with acid right up front. 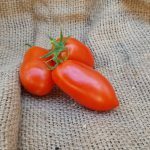 Rosso Sicilian This is an Italian heirloom with small to medium sized ribbed fruits that are firm and meaty and perfect for making sauce and paste. Bruises easily. Rated as one of the better tasting tomatoes we grew last year. San Marzano One of the more popular paste and canning tomatoes, we decided to finally offer it again after so many people requested it. 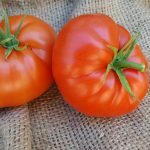 Black Krim One of our most popular varieties. A purple-black beefsteak with a subacid, mild flavor. Fruits get darker when exposed to sunlight. Productive. 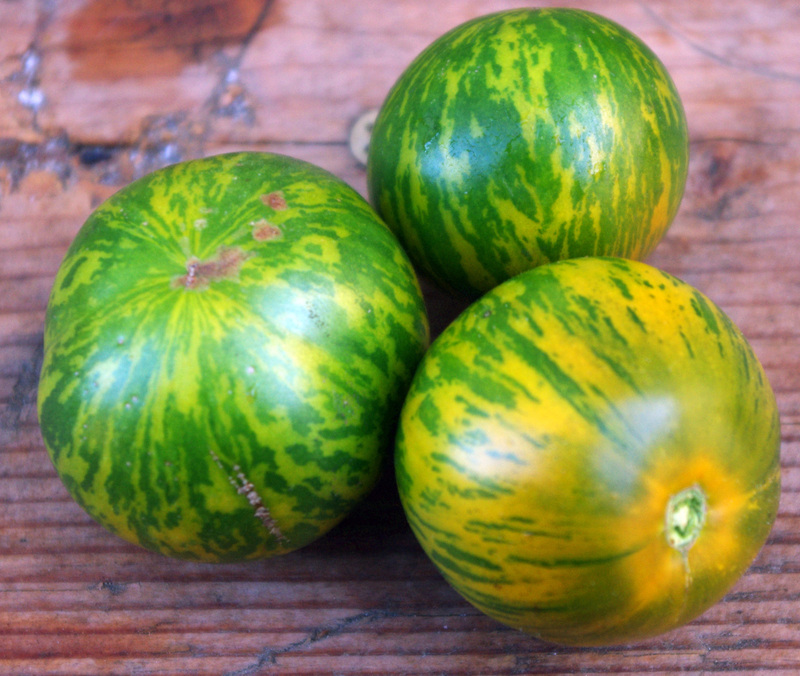 Green Zebra *SOLD OUT* Small 2-1/2″-3″ salad tomato that is green with darker green stripes. Fruit is sweet and “zingy.” Very productive plant if you can find all the fruit! The light green will have a yellow hue when ripe. Makes a really good green pesto bruschetta. Good for pots. Jubilee Productive tomato with golden large, round fruit. Delicious flavored tomato that gets 8-12 oz. Mr. Stripey (Tigerella) For whatever reason, many striped tomatoes tend not to have as much flavor as their solid colored compadres. I surmise that it is due to the coloring of the striped tomato being the primary focus, rather than the flavor. Mr. Stripey, fortunately, is not one of them. These are smaller salad size tomatoes with a sweet and tart flavor. 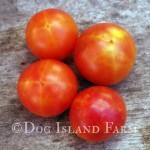 Rose De Berne A Swiss heirloom with dark pink fruit that tends to be blemish-free. Flavor is strikingly sweet with a bit of zing. Sioux *TEMPORARILY SOLD OUT* We grew this small rather unassuming red tomato two years ago only because we got a packet of free seeds. At our tomato tasting we were surprised that it outperformed all of the other tomatoes and was hands down the favorite out of 16 varieties. Sweet, tangy, rich and complex, you won’t regret making space for this variety. Stupice One of our more popular varieties. This very early tomato blew me away this year with it’s productiveness. 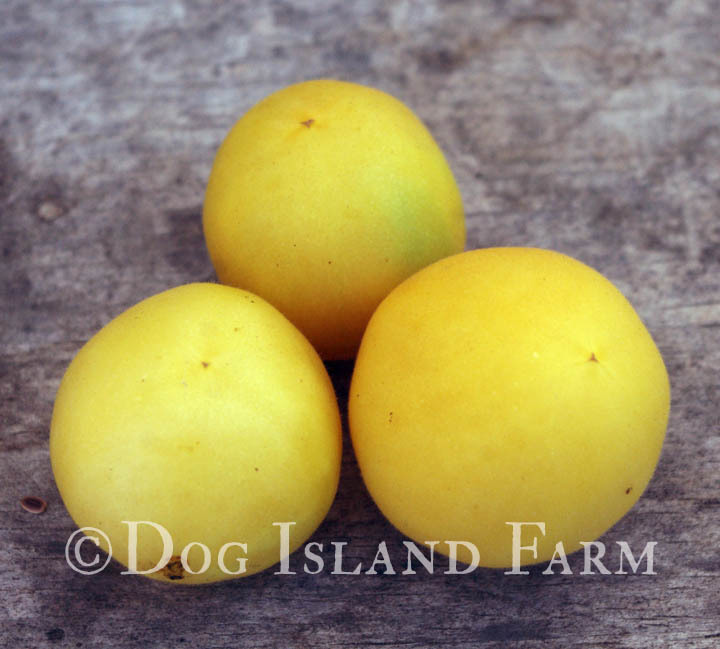 Small tomatoes, but not quite cherry size are born as early as late June and continues through until the frost. Sweet and flavorful. Good for pots. 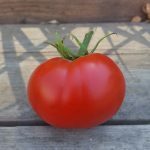 Thessaloniki A red Greek tomato that resists cracking and sun scald. Fantastic old fashioned but sweet, subacid tomato flavor. I have farmer friends that say they only will start selling the fruit from this variety after they physically can no longer eat them. Valencia Meaty, fruit is both tangy and sweet. Ripens earlier than most orange tomatoes. 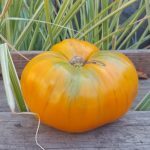 Amana Orange Giant beefsteak tomatoes that can reach 2lbs or more. This is the orange version of Brandywine and is flavorful and meaty with low acid. Ananas Noir If you can’t make up your mind about what color tomatoes to grow, this might be the one for you. Green, red, orange, yellow and purple all rolled into one tasty beefsteak-type tomato. A very tasty, sweet tomato with low acid. Anna Russian One of two oxheart type tomatoes that we are offering this year. Getting up to a pound these tomatoes start early and have sweet, juicy flesh. 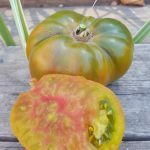 Aunt Ruby's German Green A popular green heirloom tomato that is acidic with a meaty, old fashioned flavor. It is better tasting than most red tomatoes. How could we not give this one a try? 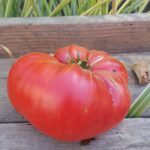 Brandywine (Sudduth’s Strain) The beefsteak that all beefsteak tomatoes should be judged by. Big, red fruits commonly over a pound but can reach two pounds are rich and intense. 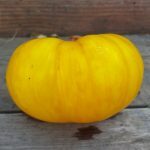 Dr. Wyche's Yellow Big, beautiful yellow beefsteak with green shoulders. Productive plant of 1lb fruits or larger. Subacid with a lovely citrusy, sweet flavor. Henderson's Winsall The original Winsall variety obtained from the USDA Seed Bank. 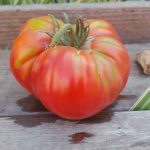 A pink beefsteak heirloom that is nearly seedless. It is a late variety but the superb flavor is worth the wait. Hillbilly Big yellow orange beefsteak with red streaks. Husband describes it as “rich, meaty, tomato-y goodness.” The favorite tomato around here. Few seeds and very fleshy. 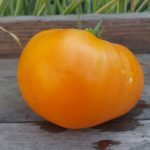 Kellogg's Breakfast Big orange beefsteak tomato. Similar in flavor to Dr. Wyche’s Yellow but with a bit more sweetness. 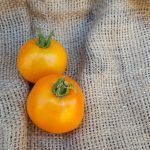 Orange Russian The first available colored oxheart type tomato. They have a fruity, sweet flavor growing to about half a pound. They have few seeds. Pork Chop Yellow with green stripes that darken to golden when ripe, fruits are between 1/2 and 3/4 lbs. Low acid with a nice sweetness. Bred locally by Brad Gates at Wild Boar Farms. One of the better tasting striped varieties. Soldacki Very tasty variety with 1lb dark pink fruit. Intense flavor yet sweet on vigorous, tall plants. 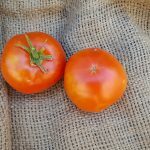 Carmello VFNT Hybrid This red French variety is thought to be one of the most productive varieties available, this tomatoes pumps out juicy fruits that have exceptional balanced flavor. Subacid and mildly sweet they are what a good tomato should taste like. Shows disease resistance to Verticillium wilt, Fusarium Wilt 1, Gray Leaf Spot, Nematodes, and Tobacco Mosaic Virus. Good for pots. Charger *SOLD OUT* A determinate tomato well adapted to different weather conditions. Flavorful and prolific, this compact plant will do well in containers. Shows disease resistance to 3 types of Fusarium wilt, verticillium wilt, Tomato Yellow Leaf Curl Virus and Gray Leaf Spot. Red Rose A cross between Brandywine and Rutgers, this is a disease and crack resistant tomato with dark pink fruit. Has good flavor that is is acidic and sweet. Rutgers Last year a customer couldn't praise this variety enough and he convinced us to carry it this year. 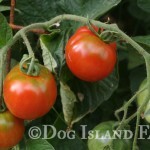 It's an old fashioned classic tomato with the flavor to match that is production and disease resistant. Anasazi* Very hard to find heirloom dry bean. Grown by the First Nations peoples in the 4 corners area. Reportedly found in the cliff dwellings of the Anasazi in the early 1900s. 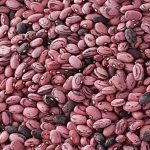 Great as baked beans or in Mexican dishes. Half runner habit. Drought tolerant. Calypso* AKA Ying Yang. 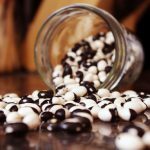 Striking black and white pattern on these beans. Great for soups. Bush habit. Empress Absolutely delicious string-less heirloom green bean. Bush habit. Purple Podded Pole* We grow this every year. So delicious and easy to pick one handed. Bonus is that the purple color makes them easy to find in the vines. Pole habit. Rattle Snake* A drought tolerant snap bean that can also be used as a dry bean. Pole habit. Rio Zape* Beautiful purple dry bean that has hints of coffee and chocolate and a velvety texture. Immature pods can also be eaten as green beans. Half runner habit. 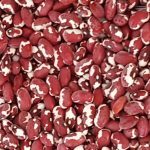 Scarlet Runner* A perennial bean in our area, this doubles as an ornamental and a food source. 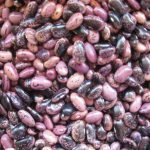 Large beans are good for snap, shell or dry beans. Beautiful scarlet red flowers. Bear Paw* An odd looking corn variety with it's split, flattened end resembling a bear paw. Popular in the 1940's as movie theater popcorn. It is our favorite popping variety with very few old maids. 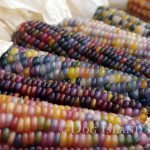 Glass Gem* The corn variety that took the internet by storm several years ago with it's beautiful colored glass like kernels. It really is this colorful in person. Can be used just for decoration or for popcorn. Silver Queen* The most popular white sweet corn in the U.S. Fantastic flavor and sweetness on 8" ears full of plump kernels. Does well in our area. Supersweet Jubilee Considered one of the best tasting supersweet sh2 corn varieties available. Plants are 8' tall with 8-9" long ears. Stays sweet off the stalk. No longer offered due to seed failure. Armenian* Technically a melon but taste like a cucumber. 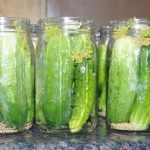 Will not get bitter like regular cucumbers and are easily digested but you can still pickle these. Mild and sweet fruit on a highly productive vine. Double Yield* This is our favorite pickling cucumber. Loads of uniform cukes that are the perfect shape and size for pickling. You pick one and 2 more take its place. Summer Dance F1 A Japanese burpless variety, fruit can get up to 9" long. Fruit is crisp and clean on productive plants that are heat tolerant. True Lemon A favorite variety among gardeners these round little cucumbers are the size and color of a lemon and have a slight lemony flavor. Plants are productive and the fruit is easily digested. Bidwell Casaba One our favorites to grow around here. Plants are very productive and produce many large fruits weight between 10 and 15 lbs. Flesh is orange and very sweet and smooth. When ripe they smell incredible and the stem readily slips from the fruit making harvest a breeze. Boule d'Or* A honeydew type melon with a hard rind that allows it to be stored for several weeks if kept cool and dry. Flesh is smooth and sweet. 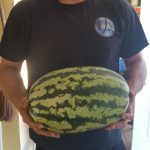 Delice de la Table* A true cantaloupe (most melons sold under this moniker are actually muskmelons) this 1-2 lb melon will fill your garden with its heavenly scent when fully ripe. Very difficult to find here in the US but more common in France where the name means "Delight of the Table." Stars Cherokee)* An oblong version of the better known heirloom Moon & Stars. Rind is dark green with speckles and splatters in yellow that are reminiscent of the moon and stars. Bright red, very sweet flesh. Orangeglo This is our favorite watermelon. We have tried many varieties but always come back to this one because it does so well. Large striped fruits that are a lovely sherbet orange on the inside. Deliciously sweet and productive. Sugar Cube Cantaloupe* Technically a musk melon, these 2 lb fruits are huge on taste. They store well and have an incredible 14% sugar content. Deep orange flesh wrapped in a heavily netted skin. Proven to show exceptional disease resistance to Fusarium Wilt and Powdery Mildew. Sugar Pot Watermelon* The first space saving, pot friendly watermelon available! Classic red watermelon flavor on 8-10 lb size fruits. Scallop Delicious patty pan type squash that is both tender but firm. Best eaten when 2-3" in diameter. Cube of Butter Bright yellow squash that have a white interior are creamy and tender. Heavy yields. Emerald Delight Zucchini Open bush habit allows for finding these zucchini easier so you don't end up with behemoths. Patio Star Bred specifically for growing in pots, this zucchini plant stays small while still producing full size fruit. Tromboncino Not your typical zucchini, this Italian heirloom has all the seeds in the bulb at the end so even when large the neck stays creamy and doesn't get pithy. Grows as a vine so it can be grown vertically to save space in tight areas. Butterbush A small single-serving butternut squash that's perfect for small space gardens and pots! Flesh is a dark copper red and are sweet and rich. Delicata* Incredibly popular heirloom squash, these don't get much larger than 8-9" long by 4" wide. Delicious, creamy orange flesh make for a good meal for two. Galeaux d'Eysines* Pink pumpkins with these "peanut" bumps covering them. Makes for lovely table centerpieces but also can be used in soups. If left on the fine the peanuts will eventually cover the entire fruit. Honeynut Little baby butternut type squashes that are a single serving. Very sweet and prolific producers. 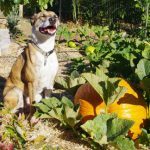 Howden* Your standard jack-o-lantern pumpkin. Usually get 15-20 lbs but have been able to get them past 75lbs if they have enough food. Marina de Chioggia Hands down, our favorite eating squash. Flesh is dry, very sweet and creamy - not stringy at all. Flavor improves with storage. 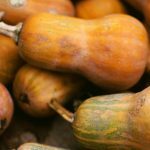 Musquee de Provence* Also known as a Fairytale Pumpkin, these deeply ribbed winter squash get up to 20lbs. Very long shelf life and delicious to eat or just use for decoration. 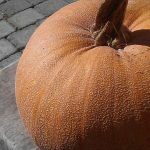 Winter Luxury A beautiful, lightly netted pumpkin that gets 5-6 lbs - the perfect size for pies. Deliciously sweet and the flesh isn't stringy. Great in pies or just by itself with a little butter. Productive. Casper* I adore this eggplant. It’s a long Japanese style eggplant with white skin and very creamy white flesh. If you aren’t a huge fan of eggplant (like myself), this is definitely one to try. It may just make you a convert. Black Beauty* A good, productive Italian style eggplant. Very good sliced, marinated and grilled or for eggplant Parmesan. Anaheim* (Nu Mex Joe E. Parker) These are the perfect roasting peppers. The thick skin easily blisters and can be peeled away after roasting. They are mild to medium heat. Not quite as productive as the smaller hot peppers, but they do give a good harvest when picked continuously. Bhut Jolokia One of the hottest peppers in the world, also known as the Ghost Pepper, has 1,000,000 Scoville units! Biscayne* A Cubanelle pepper which are famous for frying. 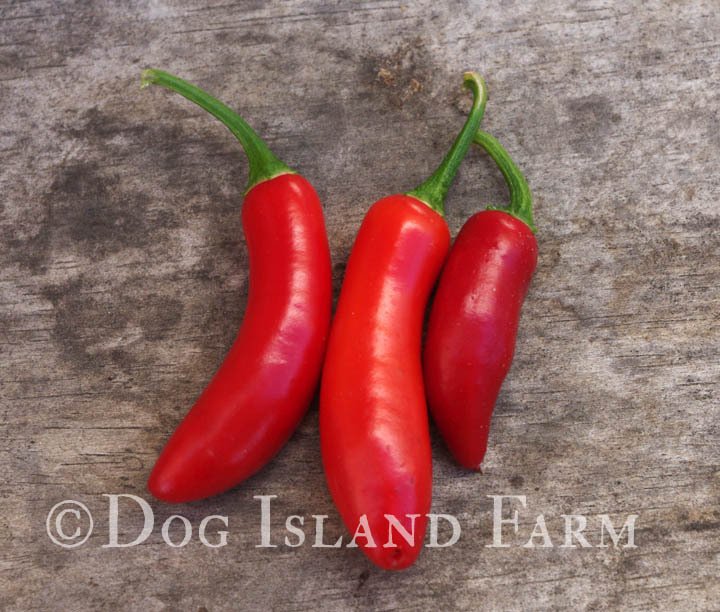 This variety is sweeter than other Cubanelle peppers and is more productive with thicker walls. Best when used before they reach ripeness and are still light green. Emerald Fire XR3 Hybrid* A medium-hot pepper that is perfect for most tastes. Less hot than a jalapeno these large peppers are great for roasting, canning, and stuffing. Garden Salsa* A medium-hot pepper that is perfect for most Americans. Less hot than a jalapeno but hotter than an Anaheim. Large fruits on large plants that are Tobacco Mosaic Virus resistant. Habanero I got several emails this past year from people that were very happy with these plants. If you want your peppers to be spicy make sure to grow them next to a habanero plant. This was a trick I learned from a friend and was surprised to find out that it works! These are productive plants with EXTRA HOT peppers. Long Red Slim Cayenne Very productive plant of HOT peppers. Walls are thin so they dry quickly. We dried the peppers (they readily dry on the plant) and then ground them into red pepper flakes. We now call them Satan Flakes because of their excessive heat. Mucho Nacho Larger and hotter than your typical jalapeno which makes them better for stuffing and grilling. Plants are vigorous and produce lots of fruits. Poblano L* A mild pepper that when dried is called an Ancho. 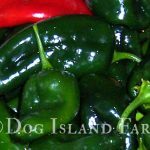 This is the classic pepper used for chili rellenos. Good producer of large heart shaped peppers. Serrano Tampequino Another very productive pepper with thick walls that are perfect for making hot sauce. 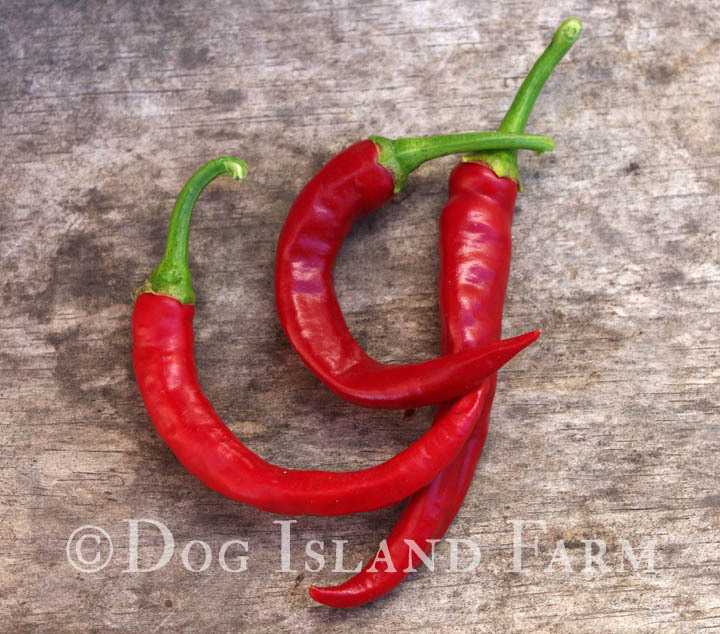 The original variety used to make Sriracha Hot Sauce. Also very hot, but not as hot as the Cayenne Slim. Thai Hot Extremely hot variety from Thailand. Clusters of bright red, thin fleshed fruits stand straight up. Popular pepper used in Asian cuisine. California Wonder The standard green and red bell pepper for California. Good production with thick walled fruits. Giant Marconi* ALL AMERICA SELECTIONS WINNER. One of the biggest sweet Italian peppers you can find. Good when eaten fresh in salads but excellent when fried or roasted. Golden CalWonder A yellow version of the dependable California Wonder pepper. Thick-walled peppers and sweet and meaty on productive plants. Orange Sun* A deep orange bell that is thick-walled and very sweet. Purple Beauty* We grew this on a whim last year and were surprised at how well it sells. It produces a multitude of medium sized, thin walled purple fruit that are easy to find in among the foliage. Black Cherry* Rich, sweet and complex, this true black tomato is productive and irresistible. Green Grape* Small, compact plants with easy to harvest fruit that full of sweet, tart, juicy flavor. Prolific producer. Isis Candy* Orange cherry tomato with red starburst. 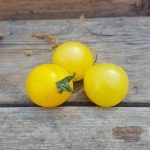 Very productive of small sweet, fruity tomatoes that you can just pop in your mouth. In our opinion it has better flavor that Sungolds. Snow White SOLD OUT Sweet ivory colored cherries that are hard to resist just popping into your mouth while picking them. They are the sweetest cherry tomatoes we've tried while still maintaining a complex flavor profile. Truly a favorite here. Amish Paste* Of the many paste tomatoes we tasted, this one was far and away, the best tasting. I look forward to trying the concentrated flavor of these when canning. Nice sized red Roma type tomatoes that are good for both canning and fresh eating (something you can’t say about most paste tomatoes). Fresh they are very sweet with acid right up front. 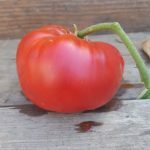 Rosso Sicilian* This is an Italian heirloom with small to medium sized ribbed fruits that are firm and meaty and perfect for making sauce and paste. Bruises easily. Rated as one of the better tasting tomatoes we grew last year. 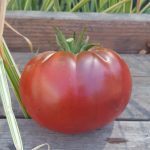 Black Krim* One of our most popular varieties. A purple-black beefsteak with a subacid, mild flavor. Fruits get darker when exposed to sunlight. Productive. 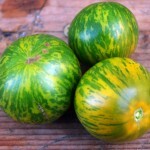 Green Zebra* Small 2-1/2″-3″ salad tomato that is green with darker green stripes. Fruit is sweet and “zingy.” Very productive plant if you can find all the fruit! The light green will have a yellow hue when ripe. Makes a really good green pesto bruschetta. Good for pots. Jubilee* Productive tomato with golden large, round fruit. Delicious flavored tomato that gets 8-12 oz. Mr. Stripey (Tigerella)* For whatever reason, many striped tomatoes tend not to have as much flavor as their solid colored compadres. I surmise that it is due to the coloring of the striped tomato being the primary focus, rather than the flavor. Mr. Stripey, fortunately, is not one of them. These are smaller salad size tomatoes with a sweet and tart flavor. Sioux* We grew this small rather unassuming red tomato two years ago only because we got a packet of free seeds. At our tomato tasting we were surprised that it outperformed all of the other tomatoes and was hands down the favorite out of 16 varieties. Sweet, tangy, rich and complex, you won’t regret making space for this variety. Stupice* One of our more popular varieties. This very early tomato blew me away this year with it’s productiveness. 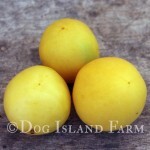 Small tomatoes, but not quite cherry size are born as early as late June and continues through until the frost. Sweet and flavorful. Good for pots. 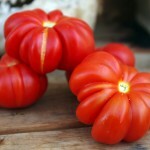 Thessaloniki* A red Greek tomato that resists cracking and sun scald. Fantastic old fashioned but sweet, subacid tomato flavor. I have farmer friends that say they only will start selling the fruit from this variety after they physically can no longer eat them. Valencia* Meaty, fruit is both tangy and sweet. Ripens earlier than most orange tomatoes. Ananas Noir* SOLD OUT If you can’t make up your mind about what color tomatoes to grow, this might be the one for you. Green, red, orange, yellow and purple all rolled into one tasty beefsteak-type tomato. A very tasty, sweet tomato with low acid. 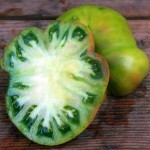 Aunt Ruby's German Green* SOLD OUT A popular green heirloom tomato that is acidic with a meaty, old fashioned flavor. It is better tasting than most red tomatoes. How could we not give this one a try? 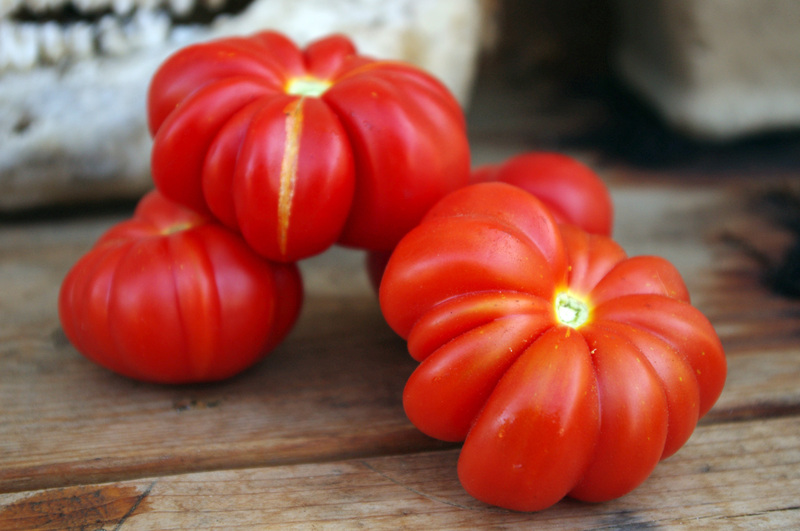 Brandywine (Sudduth’s Strain)* The beefsteak that all beefsteak tomatoes should be judged by. Big, red fruits commonly over a pound but can reach two pounds are rich and intense. Dagma's Perfection* Beautiful pastel bi-colored tomato gets up to 12 oz. Delicious and rich with hints of tropical fruit. 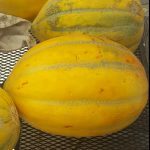 Dr. Wyche's Yellow* Big, beautiful yellow beefsteak with green shoulders. Productive plant of 1lb fruits or larger. Subacid with a lovely citrusy, sweet flavor. Hillbilly* Big yellow orange beefsteak with red streaks. Husband describes it as “rich, meaty, tomato-y goodness.” The favorite tomato around here. Few seeds and very fleshy. 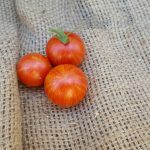 Carmello VFNT Hybrid* This red French variety is thought to be one of the most productive varieties available, this tomatoes pumps out juicy fruits that have exceptional balanced flavor. Subacid and mildly sweet they are what a good tomato should taste like. Shows disease resistance to Verticillium wilt, Fusarium Wilt 1, Gray Leaf Spot, Nematodes, and Tobacco Mosaic Virus. Good for pots. 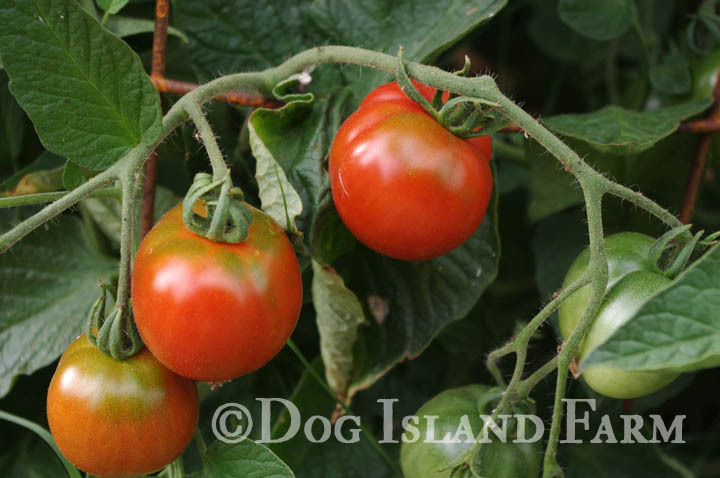 Red Rose* A cross between Brandywine and Rutgers, this is a disease and crack resistant tomato with dark pink fruit. Has good flavor that is is acidic and sweet. Rutgers* Last year a customer couldn't praise this variety enough and he convinced us to carry it this year. 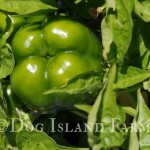 It's an old fashioned classic tomato with the flavor to match that is production and disease resistant.